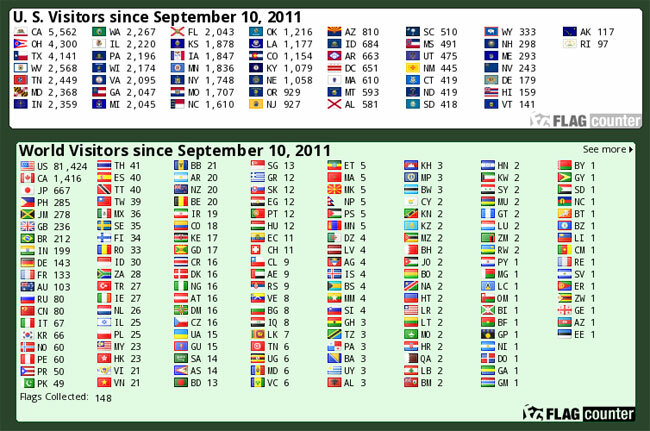 Three years ago on September 10, 2011, the National 4-H History Preservation website started using a visitor counter. This counter does not tally up “hits” on the site, but displays the actual number of visitors to the site. Your History website has had over 78,000 visitors from the United States with California residents visiting 5,373 times, followed by Ohio with 4,174 and Texas with 3,900. International visitors came from 147 countries! We’re proud of this outreach as it indicates that people are interested in 4-H History, and we look forward to increasing those numbers in the next few months. This entry was posted in 4-H History Preservation Newsletter and tagged 4-H History by Larry Krug. Bookmark the permalink.